Mish's Global Economic Trend Analysis: Stock Buybacks Peaked With Stock Market in 2007: History About to Repeat? 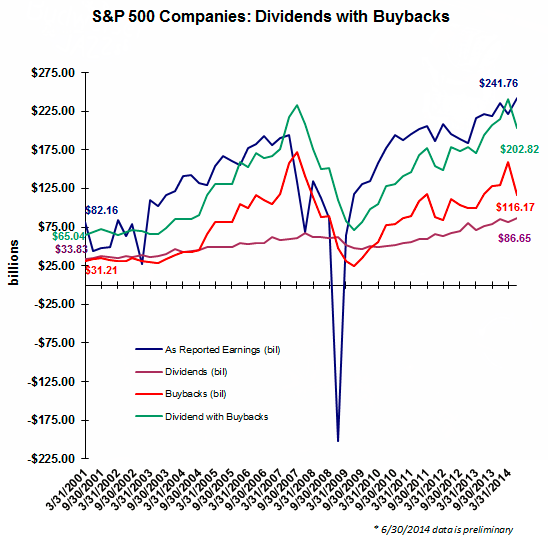 Stock Buybacks Peaked With Stock Market in 2007: History About to Repeat? 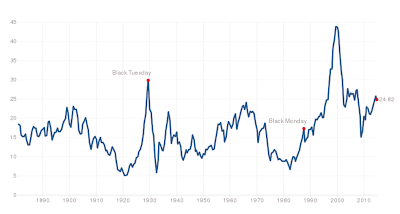 Variant Perception has an interesting post out today on stock market buybacks: Pillars of Equity Rally Fall Away. Revenues are closely linked to nominal GDP, and our US leading indicator sees this as lacklustre at best going forward. Margins we have discussed in previous reports. Our leading indicator for wages has turned up, and this tends to lead to lower profit margins. Finally, multiple expansion has been a big driver of equity returns in 2012 and 2013, accounting for about 75% of returns. However, already in 2014 it is slipping, down from 67% in May to under 50% today (chart below). In short, the pillars of equity performance are crumbling, making it difficult to see how equities can remain supported between now and into early next year. 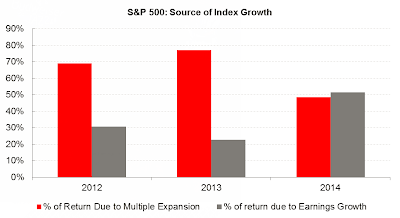 Conventional wisdom says earnings growth is the primary driver for stock performance. It's not. The price investors are willing to pay for stocks is the key driver. In 2012 nearly 70% of share price increases were due to willingness of investors to accept higher PEs. In 2013, nearly 80% of the stock market rally is attributable to higher PEs.